Wouldn't it be nice if all we had to decide in a garden is which flowers to take pictures of? Yesterday, February 25th, I had several choices. The sun coaxed open more than a few flowers, including a lovely clump of Iris reticulata 'Lady Beatrix Stanley'. Once I saw those blue blooms in the back garden near the grape arbor, it was an easy decision to make. I needed no one to persuade me to take a few pictures of them. Click, click, click. I'll add this year's picture to the pictures I've taken of these irises every year since I planted them, maybe five or six years ago. Looking up from those irises, I saw the grape arbor and remembered that last fall I noticed one of the posts holding up the wires that support the grapevine was leaning. Now that same post is flat on the ground. I wonder if anyone heard it hit the ground when it finally fell over, sometime between late last fall and yesterday. 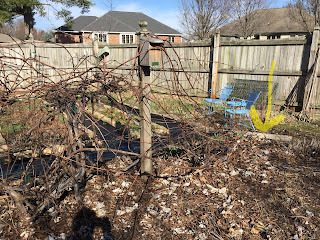 Now I need to decide if I should get a new post and fix the grape arbor or tear out the grape vines. Once I decide which way to go, I'll have to make a second decision on whether I want to do it myself or hire someone to do it for me. Either way, there is a bit of work involved. Wouldn't my time be better spent wandering about the garden taking pictures of early spring blooms? Blooms like these winter aconites? I'm proud of myself for remembering, after all these years, to plant a few winter aconites for late winter blooms. I'm not overly fond of yellow flowers so I had to get over that little quirk and convince myself that these flowers deserve a spot in my garden. Today, I like them, so it was a good decision to plant them. I'm still thinking about the grapevine. Cut or keep? If I cut it out, what will I plant in its place? I've already made that decision. Honeyberries. That's what I would plant. 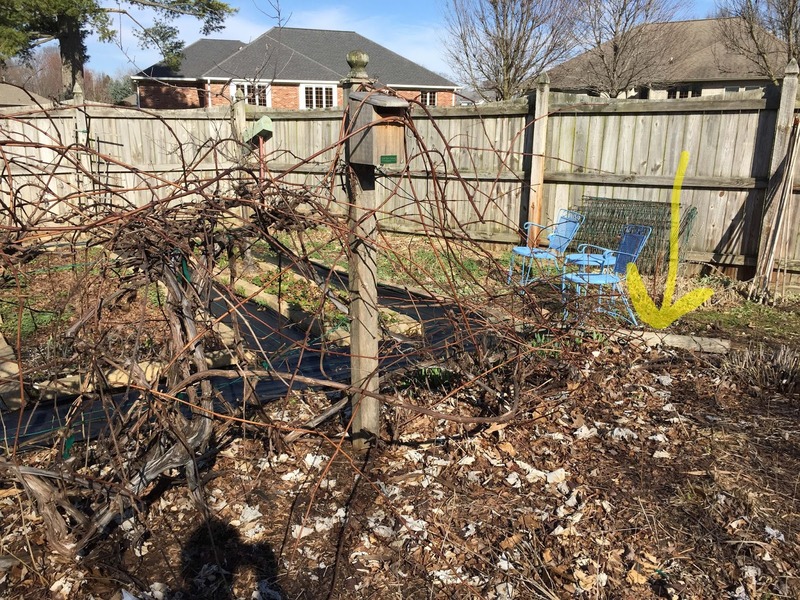 Unlike the grapevine, honeyberries won't need an annual cutting back in early spring. And they won't need support so there won't be any more rotting posts falling over in the garden. Like the grapevine, they'll produce a fruit I can eat, if I choose to do so. It's been years since I chose to eat any of the grapes, which are 'Concord' grapes, best made into a jelly or jam, with a lot of sugar to make them edible at all. The honeyberries won't need as much sugar to make them edible. I think I've just decided. Time to get out my reciprocating saw. Whack 'em, whack 'em good! I just gave my concord a hair cut. I like grape jam the best. Must keep mine. I don't know what a honeyberry is. I don't supposed I have ever come across them. Good luck with your honeyberries. My sister has a grapevine. So I have none of the work but get to enjoy the fruits of her labor. I couldn't handle having something that wild and unruly. Love your pretty blue flowers!